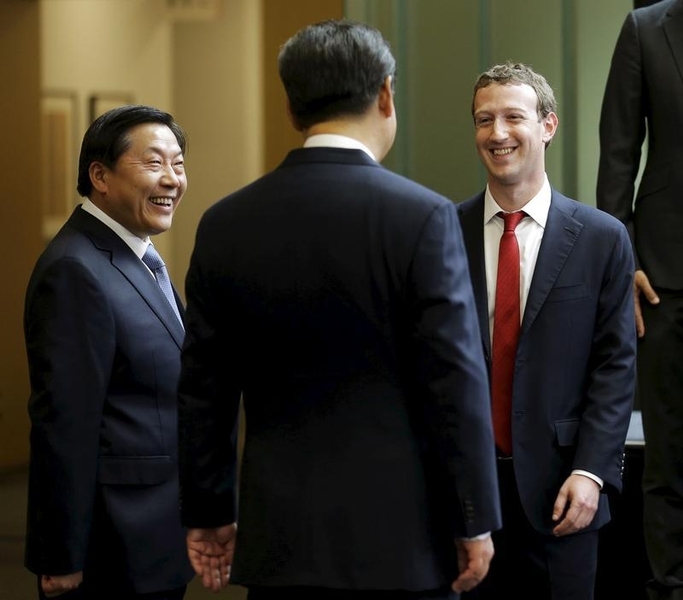 China will ‘friend’ Facebook again in 2016. Chinese censors blocked access to the $300 bln social network barely a year after it launched there in June 2008. Yet founder Mark Zuckerberg is going to great lengths to leap the Great Firewall. Rivals have shown that foreign groups can play by local rules. Even though China’s 668 million web users can’t access Facebook, the Silicon Valley company says the People’s Republic is one of its largest advertising markets as Chinese businesses eyeing overseas markets target Facebook’s 1 billion daily active users. That’s significant as ads brought in more than 95 percent of the company’s $4.5 billion in revenue in the three months to September. Now Zuckerberg is eager to connect his social network to the world’s largest internet population. The 31-year old CEO hosted a meeting with China’s internet policy chief in 2014 and met with visiting President Xi Jinping in October. The hoodie-clad founder is also learning to speak Mandarin. None of this will necessarily sway Chinese bureaucrats. Yet there are signs that relations with U.S. tech groups are thawing, provided the latter bend to local rules. Jobs networking site LinkedIn, for instance, censors certain content on its Chinese site, while note-taking app Evernote has disabled a note-sharing feature on its Chinese service. Both store local data in China as well. These strategies are paying off: LinkedIn already had around 4 million mainland users when it formally launched its Chinese service in February 2014. Now it has 10 million. What might a Chinese Facebook look like? Posts deemed too sensitive from accounts in China would be blocked in the country, while censors could also filter content from abroad. If this proved too complicated, Facebook could even opt to launch a separate service, such as an event planning app, to test the waters. Finding a local partner would help to seal the deal. Google, which retreated from the People’s Republic five years ago over censorship concerns, will introduce a Chinese app store in 2016, Reuters reported on Nov. 20. A partnership with local smartphone maker Huawei, which makes Google’s handsets, should give it a boost. Facebook could persuade another domestic manufacturer like Xiaomi to pre-install its app on Chinese phones. Re-entry would only be the beginning as Facebook would face a fierce fight with local networks like Tencent’s ubiquitous WeChat. Zuckerberg will need all the Chinese friends he can get. Facebook founder Mark Zuckerberg met with Chinese President Xi Jinping at the 8th annual U.S.-China Internet Industry Forum in Seattle on Sept. 23. In 2014, Lu Wei, China’s top internet regulator, toured the offices of Facebook and other U.S. tech companies during a visit to Silicon Valley. The world’s most popular social network has been blocked in China since 2009.